Do you know what you need to talk about? Finding a suitable and compatible housemate is the most important part of a successful home sharing arrangement. But how do you make the leap from just meeting someone to actually living with them? There is so much that is unknown. It’s okay to feel worried about all this. It’s natural. Home is sanctuary. Home is the place where you can be yourself. As Dorothy says in the Wizard of Oz, “There’s no place like home.” You have your own personal routines, style, and habits. You have your way of living at home. Let the Interviewing Questions be your road to safety. The first thing many people think of when they want to feel safe about a potential housemate is doing a background check. And while it’s fine to go ahead and do one, a background check will only tell you if the person has a criminal history and what their credit is like. It doesn’t tell you if you can live with that person. You need a different way to check if the person is compatible with you. Something like a pilot’s checklist. Every time a pilot prepares to fly a plane, the pilot goes through a checklist. Of course the pilot knows what she should be checking—she’s probably done it hundreds of times—but the checklist ensures that in the routine of the task she doesn’t skip even one item. That one that if missed might crash the plane. The “Interviewing Questions” are not as long as the pilot’s checklist. They much simpler: they focus on the nitty-gritty details and aspects of sharing—details that often get overlooked when you don’t have experience in sharing housing. It’s a tool for you to use at two different stages in your home-mate search. In the first stage, it will help you assess what is really important to you in how you live. In the second stage, you can compare answers with another person who has also completed the compatibility questions. The Interviewing Questions offer a structure for your exploration of compatibility with a potential home-mate. It’s your guide to talking with a potential housemate about those things that might crash the relationship if you don’t have clarity and agreement about how you’d live together. This is not a natural conversation. (Flying a plane is not a natural task.) It’s a bit artificial and contrived. Slightly uncomfortable, but with the questions as a guide you will be much more comfortable. The real power of the Interviewing Questions comes in comparing your answers with those of a potential home-mate. With the questions, you have a script to follow—it will help you be thorough and complete in your exploration. Thirteen carefully honed questions help you identify what’s important to you in sharing a home. 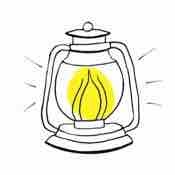 Comments section for you to note any special interests or concerns so that you don’t forget to consider them. If you are like other people, you’ll discover that it’s fun to compare answers and that the conversation moves easily. Annamarie’s Interviewing Questions have been really helpful to me both in thinking through what’s really important to me and learning what to ask when I’m interviewing a potential housemate. The survey makes a really good jumping-off point to start the process, especially if both people have completed it. It used to be that I would just go on my gut—how we got along, what values you we might share, etc.—but I’ve learned that our household habits are what really make the difference! How many times have you considered having a home-mate but got stopped by apprehension, doubting that you could do it successfully? 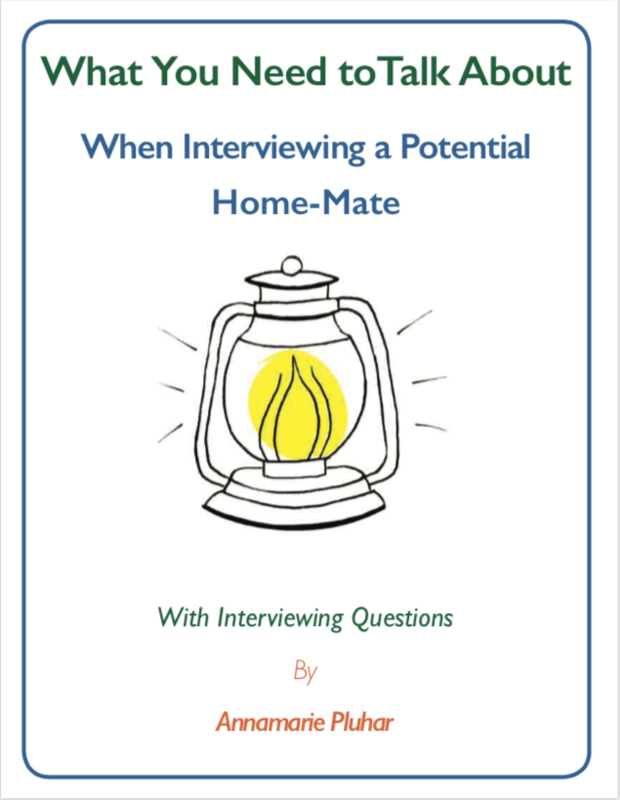 The PDF What You Need to Talk About When Interviewing a Potential Home-Mate expands on each of these critical areas, helping you consider the options possible in a home-mate arrangement. With advice on how to conduct this conversation, the guide is a valuable source of light and insight into your search process. The questionnaire was helpful to me in that it forced me to be entirely truthful, which turned out to be quite enlightening. And, the questionnaire is such a good one that a person should suggest that any potential home -mate fill one out as well, not by forcing them to do it, but by offering the option. If the potential home-mate declines to complete it, well, that would certainly be revelatory! Tools like this one are what make the process of finding the “right one” less fraught with uncertainty, or fear, or dread, or whatever. I am confident that with these questions you will gain insight and perspective on yourself and on the person you are interviewing. You’ll discover things you might have overlooked. It will give you confidence in your decision-making. If you have any questions or concerns about this, I’ll be happy to answer them. Please fill out the form below. Do you have questions about this? Use this space to ask me.